This past week, I went to visit my friend Chris Orcutt to test out the equipment I bought for the three documentaries I’m shooting. While I had already spent a lot of time researching what to get and had purchased 99% of what I needed, I wanted to do a dry-run shoot and see how it was working with it all in a “real” environment. With three documentaries being shot at once, I didn’t want to skimp on the equipment, and I sure didn’t: A Canon 5D Mrk II, with a collection of L series of lenses. I got a great microphone, and because it’s not really wise to use the audio that comes with the camera itself, a separate digital recorder. If there’s one thing I would inform anyone getting into shooting something like a documentary, it’s this: you really have to know the equipment cold. And the way you do that is to shoot dry-run days of something nearby and repeatable, be it a friend, a backyard, a pet. I chose a friend. Chris has a couple really nice manual typewriters, so we decided he’d set up a workstation in his living room and we’d do some shoots over an afternoon. You can go to the Youtube page here. There’s no scripting or pre-planning, and I’m just talking with him and coming up with where to go next. All told, I shot about 30 minutes of footage, recorded 40 minutes of audio. I could have made this three times as long (we did discuss typewriters a bit), but I just wanted to show people where I was going with the look, the feel, the approach to the filming. I think there’s no question the new equipment looks better than GET LAMP did, although GET LAMP looked much better than BBS Documentary did. Obviously there’s a lot more to a documentary than the pretty shots and the sound, but it sure helps when I’ve gotten a rare interview with a historically important figure to know they’re going to look really, really good. Also, the camera setup itself is very small and light, so readjusting things for a different shot is quite trivial, as is recording sound all the time during a shoot to get statements in between camera shots. One critical thing to mention, to anyone reading this who will use a camera and sound setup with separately recorded sound, or multiple camera angles, is a program called PluralEyes. To synchronize up even a handful of camera shots and recorded audio would be tedious and prone to error – in the case of my shot footage, the software synchronized all my video and audio in 40 seconds. I can’t recommend this program enough. It’ll pay for itself in a day of work. If you look along the bottom, you can see the whole timeline from start to finish. The greyed-out track is the original camera audio, which I don’t use in favor of what was recorded with the Zoom H4N digital recorder and the Seinnheiser microphone. Places where there are two tracks are audio are where you hear the typing in the background. 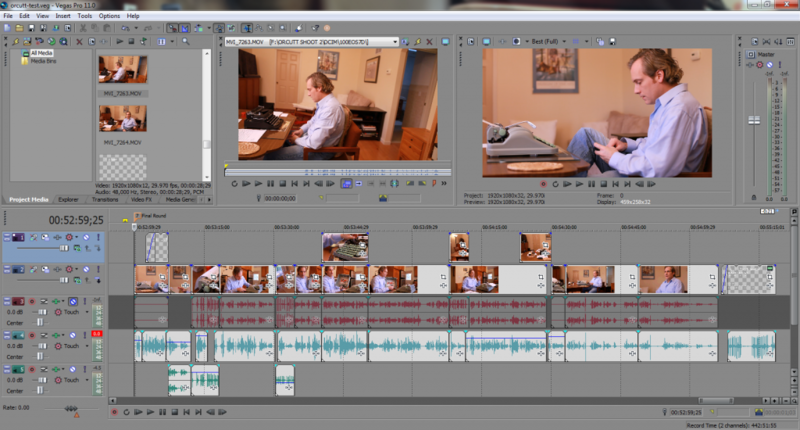 Even though this is a basic little film, it has over 40 editing points. I probably spent an hour putting it all together. The workflow is different, but I think it’s obvious this new set of films are going to really look fantastic. Here’s hoping. Oh, one last thing: Chris Orcutt is a full-time writer, and he just completed his newest novel, the first of a detective series. Called A Real Piece of Work, I devoured the thing in two days and loved it. When he sells 1,000 copies, he’ll release the second in the series, so I have a vested interest in letting as many people know about it as possible. You can read up about it at www.dakotapi.com. I think the Audio-Quality needs work. I can’t put my finger on the precise Reasons. I hear a bit of echo near the start. The Face (especially the eyes) is in some shots slightly out of Focus. The Moving shot is a bit of a risk with fixed lenses. The Focussing Bit near the End distracts a bit (I think Camera Lenses overshoot to fast when adjusting). Karl von Moller also uses a 5D markII for his Documentary “The State of Electronics” (about the Australian Electronics Industry). since it is definitely professional grade (award-winning film editors and whatnot) and free. Have you looked at it? What are your thoughts? It has an auto-sync feature, but I don’t know how advanced it is compared to what you’re using. I’ve been excited about it since it turned open source, but have been waiting to try it until they release a Linux version (coming soon, I’m told). Also, I have to agree about the audio. I’m not an audiophile, but it sounded…. “hollow”? Maybe it was the the room that was causing it. I started editing with Sony Vegas (then called Video Vegas) around 2002. so 10 years ago. Lightworks is barely ready for use, regardless of a few editors being into it. Open Source is nice but it’s not my make or break. As for the audio, known situation – I misread a setting on the recorder, and placed the mic a ways back (I was going to do other settings but got wrapped up on the camera settings and lenses). It’s been handled.